The Ohio birding network went aflame on the afternoon of Monday, December 28, when word went out about a Brambling that was discovered in Medina County. 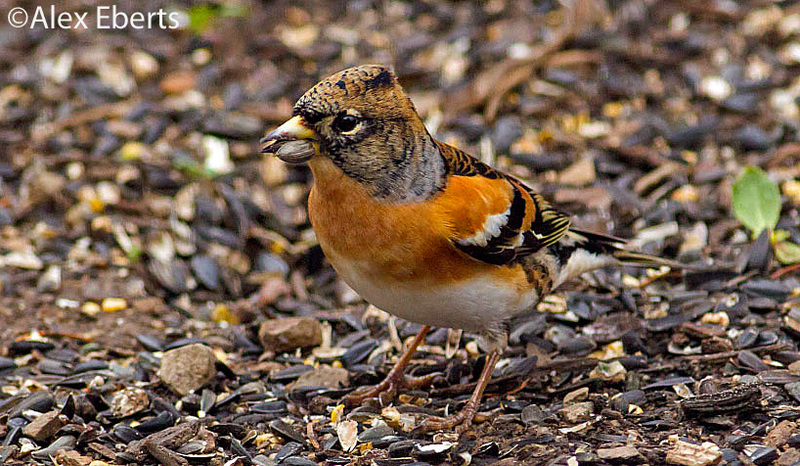 In this part of the world, a Brambling is a mega-rarity of the highest order. There had only been one prior Ohio record, WAY back in 1987. The current bird and the one of 28 years ago share some eerie similarities. More on that later. Recently retired Medina County Park District naturalist Dan Bertsch found the bird, and must have nearly flipped his lid when he realized what he was looking at. Dan's discovery sparked a Great Medina County Brambling Rush, as listers from far and wide dropped everything and sped to the locale. 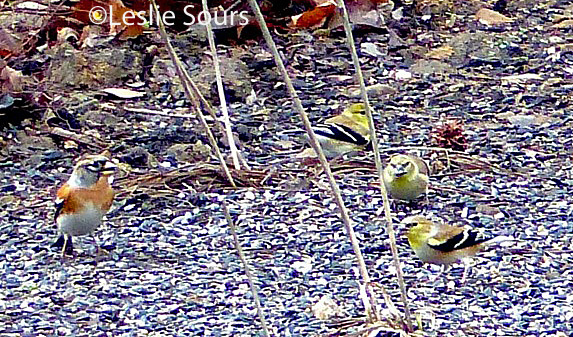 That's the Brambling, on the left, consorting with some much more familiar fare (for us), three American Goldfinches. Perhaps the Brambling feels comfortable with them, as they're all in the same family (Fringillidae). I suspect that this is a scene similar to how Dan first saw the bird. It's been frequenting some feeders at a house or houses very near Allardale Park, which is one of the Medina County Park District's holdings. Leslie Sours, who made this image, was among the wave of first responders, and at that time the best ways of seeing the bird had yet to be determined. Views were rather distant, but certainly diagnostic. The Brambling has an enormous range, as depicted by the green portion of the map. The finch is a common breeder in much of northern Asia and Europe, and is highly migratory, wintering throughout the southern portion of the green area. 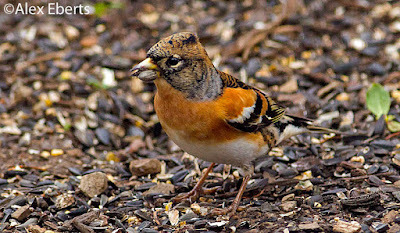 Bramblings can form enormous winter roosts, and individuals are well known to wander far afield. The areas of the map in blue represent regions where wayward Bramblings have appeared, but records would be very few and quite far between in most of the shaded blue areas. The scientific name of this species is Fringilla montifringilla, which literally translated means "Mountain Finch." The great Swedish naturalist and Father of Binomial Nomenclature Carl Linnaeus bestowed this name on the finch, and published it in his Systema Naturae (10th edition) in 1758. He described the finch under its current name, Fringilla montifringilla, a remarkable case of nomenclatural longevity. This great photo by Alex Eberts really brings out the charms of this stocky bullheaded little finch. It's easy to see why Dan would have done a double-take upon clapping eyes upon it. It's an adult male, and no regularly occurring Ohio species really looks anything like this. In breeding finery, the bird's head and back will be ebony black. OK, to the weirdness. 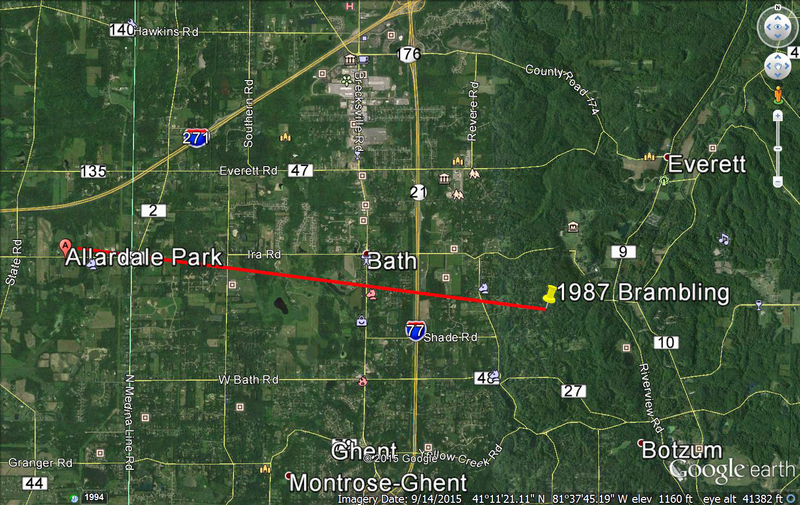 This google map shows the location of the current Brambling near Allardale Park at the left end of the red line, and the general location of the 1987 Brambling at the right end of the line. The two sightings are barely five miles apart! The 1987 bird turned up on the heels of a major snowstorm on March 31, 1987, and stayed until April 7. 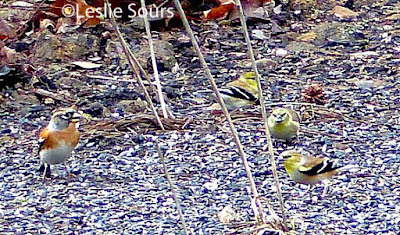 It also spawned an avalanche of visiting birders, but the star was not nearly as cooperative as the current Brambling. I was one of the lucky ones that got to see it well. Many birders, often having traveled long distances, were unsuccessful. Although I've not been to see the present bird, I've seen photos of the lay of the land, and it appears remarkably similar to the neighborhood that hosted the first bird. Then, as now, birders had to stand along the public right-of-way of the road, and try not to trespass onto private property or otherwise misbehave. I guess there have been some minor squabbles and bickering about behavior among the current Brambling-seeking throngs, just as there was with the first one. I remember that shortly after arriving at the 1987 Brambling site, I was watching and waiting with the others when I saw movement in a bush. A gentleman, who shall remain nameless, had crawled into the shrubbery - we were supposed to stay off the property - and was using the thicket as a blind. Moments later, a quite loud, large and brash woman, who will also remain nameless, spotted the trespassing birder. She let out a roar and charged into the brush, tugging the much smaller man out of there like a ragdoll, all the while berating him for his stupidity. It is a moment of birding infamy I may possibly never cast from my mind. So, if you get the opportunity to visit this beautiful rarity, do so! You may not get another chance to see another Brambling in Ohio. But I'd advise staying out of the shrubs and on the road with everyone else. And if you see the feeder-owners or any of the neighbors, be sure and thank them for their tolerance. And offer kudos on a great find to Dan Bertsch should you cross his path. A small stream rushes and gurgles through a wooded ravine in Tar Hollow State Forest in southeastern Ohio. I found myself in this woodland recently; a place I seldom get to these days. At 16,000+ acres, Tar Hollow is one of Ohio's great biological hotspots, harboring a vast array of flora and fauna. On this day, steady rains vacillated between mists, sprinkles, and showers, which made finding critters tough. 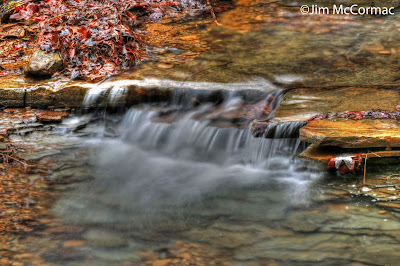 But all that moisture brings its own charms, such as turning this normally dry creek into a showy waterscape. 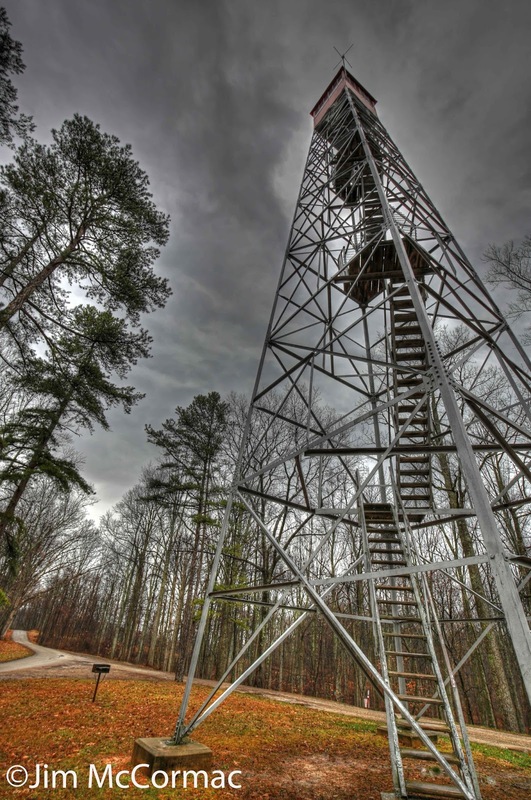 There is an old school fire tower in Tar Hollow, and visitors are free to climb it. I did, of course - such structures are irresistible lookouts. The boxlike cabin at the summit was locked, so I had to make due with the view from just below. 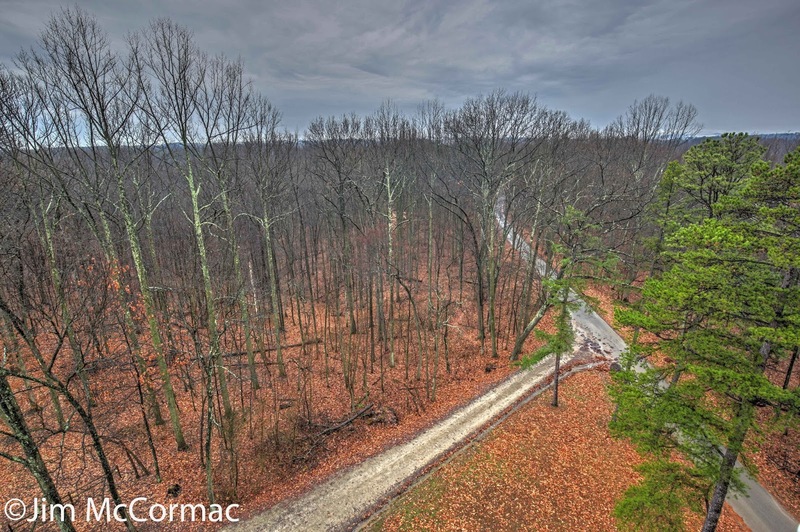 From the tower's (near) summit, a grand vista of the sprawling forest can be had. As is to be expected in late December, the surrounding deciduous woodlands are leafless and bare, but a couple of towering pitch pines (Pinus rigida) offer a jolt of brightness. Conifers are always appealing eye candy, and especially so in winter when little else of color can be seen. Pitch pine are, to my eye, especially good looking gymnosperms. I don't understand why they aren't sold more in the nursery trade, unless there is some quirk to them that makes it hard to grow the trees. They are quite valuable to wildlife. Had I been at this spot in April, I'd about guarantee the sweet trills of pine warblers would be heard. The warblers methodically creep through the fascicles of long needles, seeking pine-specializing caterpillars and other entomological morsels. After returning to earth, I walked around the pines and was struck by glistening raindrops clinging to the ends of the needles. The trees looked bejeweled, and upon inspection I could see the towering trunk of the pines reflected back within the tiny droplets. Eventually the drops will break their connection with the needles and fall to the ground. The tree will sponge them up through its root system, and the water will, in a tiny way, assist the pine with its growth. In time, the water will be carried through the tree and out into the needles where it will be released back into the atmosphere via transpiration. And thus the cycle goes. 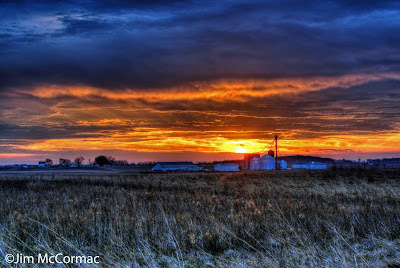 Dawn's first light paints a gorgeous palette of colors over a Pickaway Plains prairie near Circleville, Ohio. The local landowner put about 1,000 acres into native tallgrass prairie about a decade ago. The results have been stunning. On this quick visit, there were several Northern Harriers and Short-eared Owls, and a few dozen Eastern Meadowlarks, among many other species. Since this ground was restored to prairie, the spike in biodiversity, perhaps most noticeably birds, has been breathtaking. The Pickaway Plains was once one of Ohio's great prairie provinces. The region was about seven miles long and three miles wide, centered on the Scioto River and stretching from approximately the city of Circleville south into Ross County. Over 99% of the former prairie has been converted to agriculture or otherwise developed. This grassland shows that if you restore it, they will come. The wet, slushy worst of Ohio's winter is upon us. Right now it's about 50 F with rain. Today featured the leaden skies that we see so much of in winter. Temperatures have been yo-yo'ing all over the place, from semi-balmy to downright frigid. Fortunately, tomorrow is Winter Solstice, and after that the days grow longer, leading us by our Seasonal Affective Disordered brains ever closer to spring and the re-emergence of life. Especially insect life! I dip into the files to share a cool bug that I meant to write about long ago, but just never got around to. It may evoke memories of warmer, longer days. 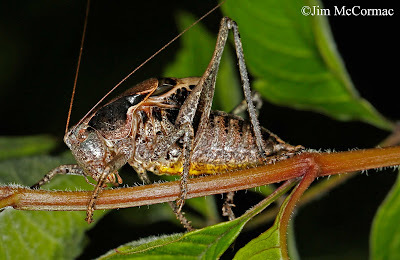 A Road Warrior of a katydid if there ever was one. Back on June 11, I found myself at the always amazing Edge of Appalachia Preserve in Adams County, hanging out at the Eulett Center. It was past dark, and we were doing some nocturnal field work. Both Mark Zloba and I had noticed a discreet rasping husky broken trill, and were flummoxed by its identity. We thought it might be a conehead of some sort, but were unsure and wanted to run one down for a positive identification. Mark finally spotted one of the singers in thick grasses, and we were surprised to see that it was a shieldback. Further queries into the literature led us to believe it is the American Shieldback, Atlanticus americanus. You can hear the song RIGHT HERE. 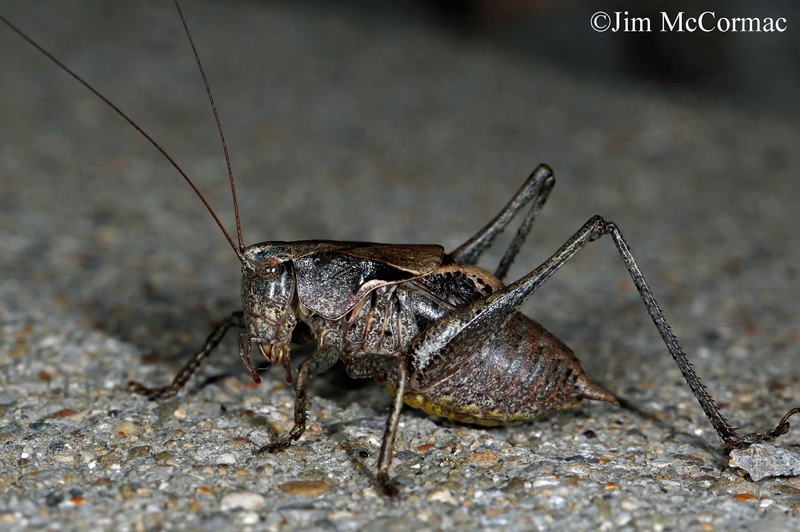 It isn't hard to see how this group of katydids (subfamily Tettigoniinae) gets its name. The animal looks as if it has been fitted with armor plating. Despite their tanklike appearance, these are very interesting and ornate insects. There are several dozen species in the U.S., although only a handful occur in Ohio. Because their songs tend to be soft and easily overlooked, the group in general is probably not that well known. We finally brought the animal out of the grasses for a photo shoot, and so that at all who were present could admire it. 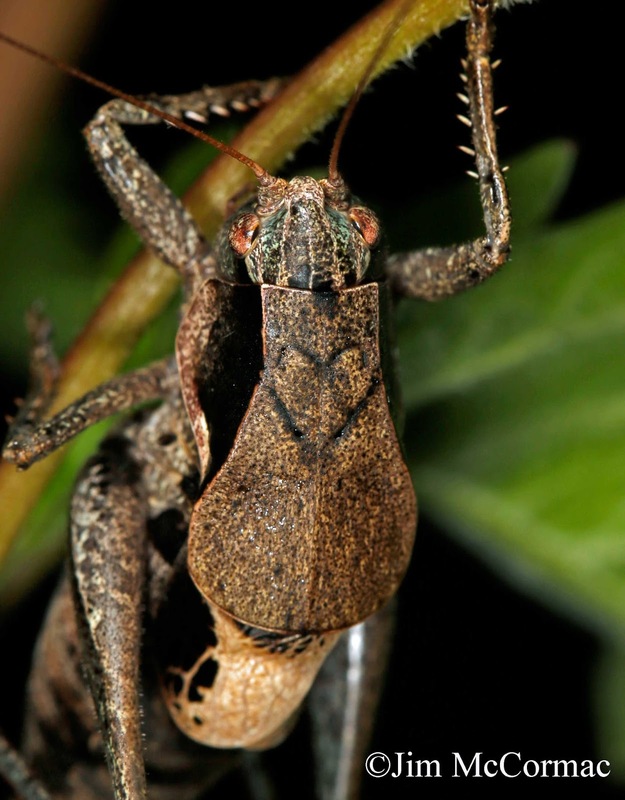 While these katydids will forage on vegetation, they often eschew the vegetarian lifestyle and scavenge dead insects, and will even overpower and consume live insects when chance permits. I look forward to warmer days ahead, when singing insects such as this shieldback contribute their melodies to warm summer days and nights. I'm always playing with different photographic techniques. A few different (for me) attempts follow. A 1st-cycle Ring-billed Gull prepares to drop onto the water. Bernie Master and I headed to Springfield Lake near Akron yesterday, to try and see a Kelp Gull that has been in the area for over a week. We were joined by well over a hundred other birders, but no luck - the rare gull stood all of us up. Such is life on the rare bird circuit. We arrived before it was light, and as dawn brightened the landscape and it became ever more apparent that the Kelp Gull was not on the lake, I turned the lens to much more mundane Ring-billed Gulls. The light was horrid in nearly every way - wasn't much of it, and what there was came from a suboptimal direction. Normally I'd probably not even click the shutter in such a situation. But what the heck. I decided to try for some "creative blurs". I've seen photos dubbed as creative blurs which to me have been bad photos masquerading under an artsy name. And I've seen creative blurs which looked cool and very out-of-the-box. I don't know where mine stands on the scale of good to bad, but I rather like it. This gull was shot with the Canon 7D Mark II and 500mm f/4 II + 1.4x extender, at f/5.6, ISO 1250, 1/320, with +2/3rds exposure compensation. 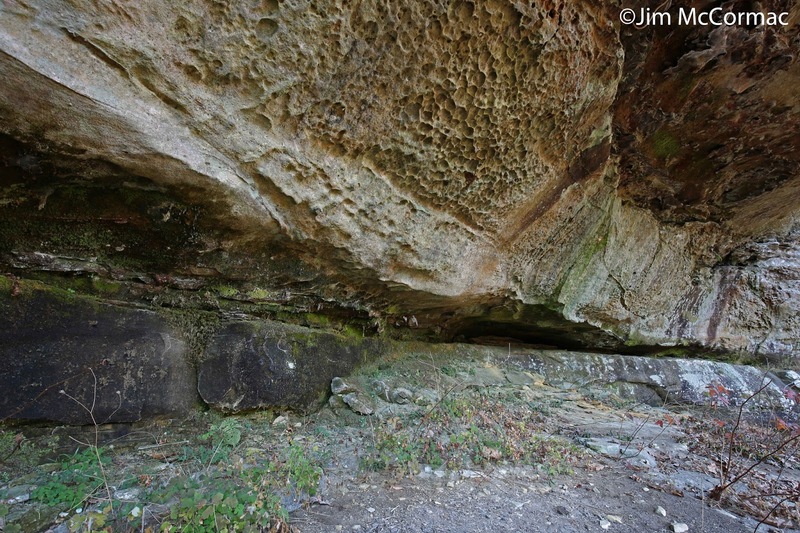 This cliff face is in Clear Creek Metro Park, and is a local legend known as Written Rock. Back in the day, it was covered with colorful graffiti from toe to crest. I used to marvel at how the taggers could access the inaccessible areas of the cliff to spray their drivel. When Franklin County Metro Parks took over Clear Creek, they blasted the rocks clean and have kept it that way. 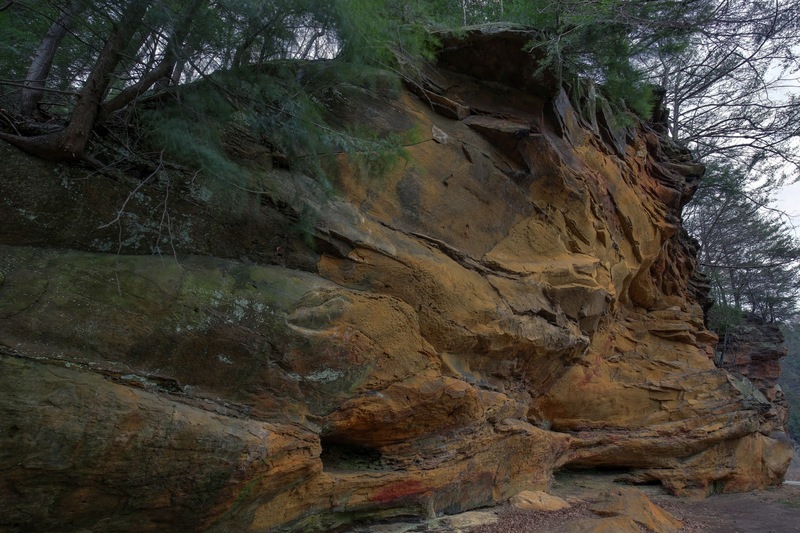 Written Rock is an exceptionally colorful piece of sandstone, but hard to photograph. The high contrast between dark and light areas of the cliff, and the brightly lit sky around the borders, means some parts of the image will be greatly over or under exposed. Enter High Dynamic Range (HDR) photography. I'd wanted to fool with HDR for some time, and have finally gotten around to it. Here's how it works: Select the composition, and frame your image with the camera mounted on a tripod. A remote shutter release is best, as you don't want the camera to move at all between shots. Then take a series of three to five images ranging from overexposed enough to light the darkest areas, to underexposed enough to not blow out the brightest areas. Then use special software (I used HDRsoft) to blend them all together. The result should be a composite photo that is fairly evenly lit throughout - something that couldn't really be done with a single image, at least without all manner of post-processing work that would be beyond me. 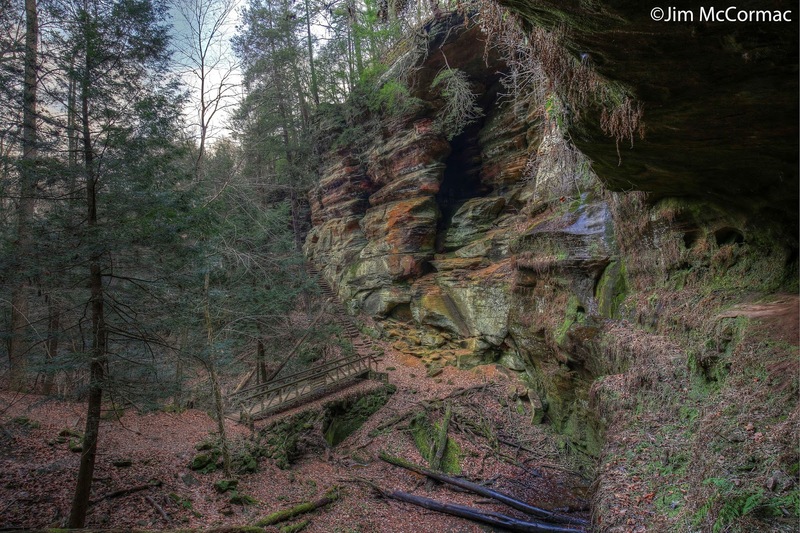 This is Rock House in the Hocking Hills, and this composition is fraught with peril for the photographer. I am crouched in the shady apse of a rock overhang, shooting out into much brighter light of varying degrees. Such a situation is where HDR excels, bringing up the dark areas and toning down the bright areas. I used five different images to create this shot. 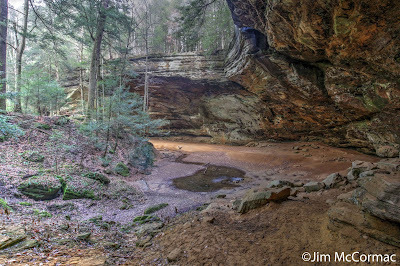 Ash Cave, one of the largest and most beautiful of the Hocking Hills' incredible rock formations. This was my first effort at intentionally taking images in the field with HDR in mind. As with the previous two, five images of different exposures were melded together to create the image. This photo is closer to what the eye sees than what is recorded by a single photo. Your eyes moderate the very bright light from the sky in the photo's upper lefthand corner, and brighten the shady recesses on the right. A single photo would be overexposed on the left, or grossly underexposed on the right. HDR allows one to have their photographic cake, and eat it, too. I look forward to more experimentation, HDR and otherwise. Today was unseasonably balmy indeed, the thermometer striking 70 F here in central Ohio. I spent the afternoon with David and Laura Hughes in the beautiful and biodiversity-filled Clear Creek Valley searching for interesting things. Of which we found plenty, and Dave and I came away with many "keeper" photos. 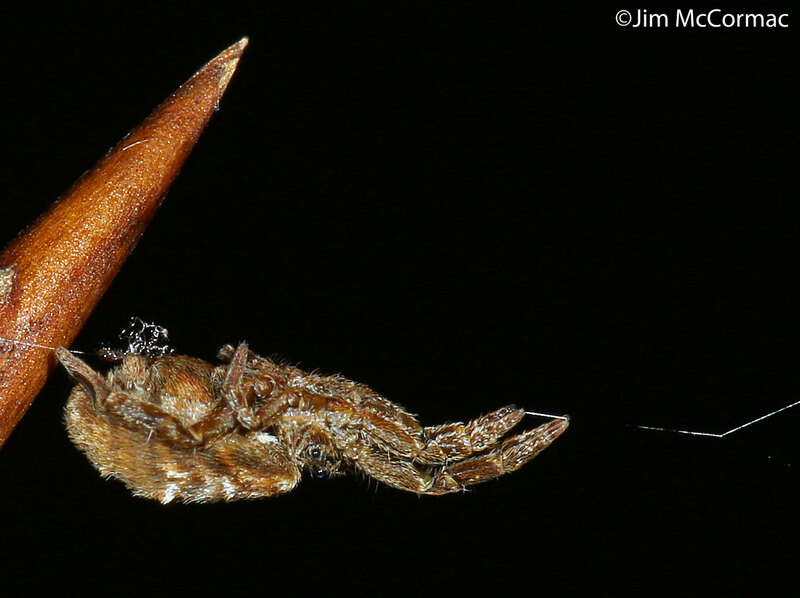 This tiny spider was at the top of the heap of fascinating subjects. Laura, with her eagle eyes, somehow spotted the small web which the animal had stretched between beech tree saplings. The spider is just right of the pointy beech bud, with its elegant triangular web flaring out through the rest of the image, and beyond. The spider is quite tiny; it measures only a few millimeters. 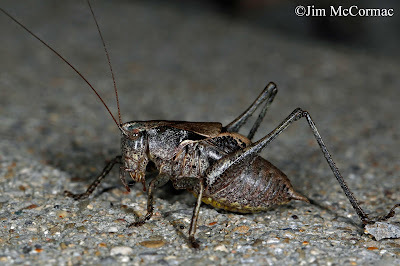 In addition to its manner of capturing prey, which we will soon see, it is also a representative of the family Uloboridae, which are noteworthy for being nonvenomous. 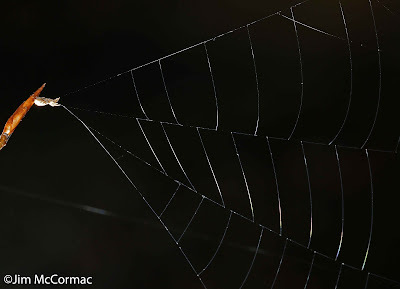 The spider is holding several silken lines, which connect to critical parts of its web. She will remain motionless and keeping tension on those lines until prey strikes the web. A closeup of our hardworking spider, who is also a brilliant engineer. As she completed construction of the core of the big triangular web, she attached a tension line securely to this beech bud. She then used that to pull herself backwards and into the bud, in the process ratcheting the entire web tighter and tighter until it is finally taut as a firm trampoline. When a victim - small fly or some such beast - blunders into the web, she will instantly release her tension lines. You can see the excess slack in these now taut lines piled up over her abdomen like a little opaque bubble. When the lines are released, the web collapses over the victim, sort of like having a parachute dropped over one's head. Hopelessly snared, the hapless prey does not have long to wait until the spider rushes out and even more thoroughly enshrouds it in a dense cloak of silk. For a fabulous video of the whole process, courtesy of Sir David Attenborough, CLICK HERE. An obscure sandstone alcove - a cavelet, if you will - along a Hocking County, Ohio lane. I stop here every few years to check on its rare inhabitant. As fate would have it, that was last Saturday. To seek our quarry, we must go over and peer into the deepest recess of this large overhang - middle of the photo, just right of center. Yes! There it is, hanging from the ceiling just as its done for many decades and probably far longer. 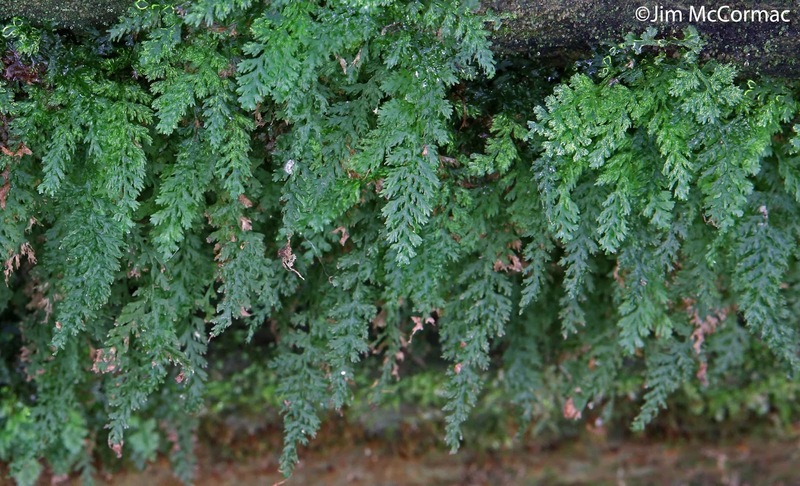 The stalactitic growth is the very rare Appalachian Filmy Fern, Trichomanes boschianum. This patch has been known for far longer than I've been into plants, and who knows how long it has occupied this perpetually dim niche before it was discovered. The few and widely scattered populations of this curious fern are thought to be very old in most cases. The fronds are quite beautiful upon close inspection, but such inspection takes a bit of work. Very little light penetrates back to the area occupied by the fern, and one could easily glance into its alcove and overlook it. The "filmy" moniker comes from the exceptionally thin fronds, which are only one cell thick. This fern belongs to the successful fern family Hymenophyllaceae, which is comprised of over 600 species and has been around since at least the Upper Triassic Period some 200 million years ago. Filmy Ferns (or Bristle Ferns, as they are sometimes known) have a cosmopolitan distribution, occurring over much of the world but nearly always in constantly damp or misty sites. The fern featured here is no exception - this small sandstone recess is liberally wetted by constant seeps percolating from the rocks. NOTE: I have come to dislike flash photography for plants, in many cases. The previous photos that I have made of this species were with flash, and I never much liked the look. But flash, or a VERY long shutter speed is required given the darkness of the site. So this time, I lugged my tripod along and tried something different. These images were made sans flash. The photo above was created with the Canon 5D Mark III and Tamron 70-200 f/2.8 lens, at 200mm. Settings were f/14, ISO 100, and 20 (twenty!) second exposure. Not a very conventional plant photography setup but it worked okay - much better than with flash in my opinion. Courtesy of the Flora North America, here is a map of the distribution of the Appalachian Filmy Fern. It would be endemic to eastern North America were it not for one bizarre outlier population in the state of Chihuahua, Mexico. Its core distribution is compact, and the populations are few and far between. The fern has been found in 12 states, and it is listed as endangered in eight of them, threatened in two, and as "S3" (rare but not highly imperiled) in one. Only in the Commonwealth of Kentucky is Appalachian Filmy Fern not listed. It's known from 21 counties there, but I bet the casual botanist would still have to work to find a population. There are two Ohio sites. The other is about three miles west and ever so slightly north of the population shown in this article. These are the most northerly Trichomanes boschianum populations in the world. One of them is diligently protected, the other is just sort of hidden in an area of little interest to passersby. Saxicolous (rock-dwelling) plants often suffer greatly due to trampling and other abuses inflicted by rock climbers and others who can't resist playing on the rocks. Hopefully the two Ohio populations will be spared the excesses of man. 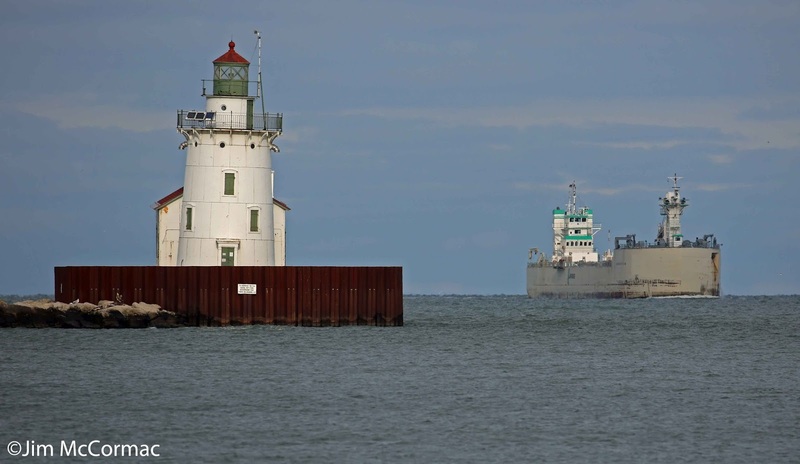 HURON, Ohio — I recently traveled to the Lake Erie town of Huron, population 7,000. Huron, which was voted one of “America’s Coolest Small Towns” for 2015 by Budget Travel magazine, is the epicenter of Erie County bird-watching. Our second-smallest county is probably best-known as the birthplace of Thomas Alva Edison and the home of Cedar Point. 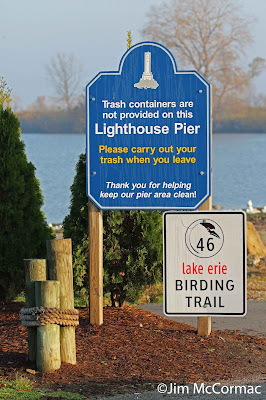 It also hosts a remarkable suite of Lake Erie bird-watching hot spots. Bookending Huron is Old Woman Creek National Estuarine Research Reserve and Sheldon Marsh State Nature Preserve. Three miles downstream on the Huron River is another state nature preserve, DuPont Marsh. My destination was yet another hot spot, the municipal pier at the confluence of the Huron River and Lake Erie in the middle of town. The half-mile-long pier’s terminus puts observers in a fantastic location to spot birds. November and December brings the most birds to Huron. The concentrations of red-breasted mergansers can be staggering. One-day estimates of these fish-eating ducks can range into the tens of thousands. Massive flocks resemble storm clouds scudding over Lake Erie. The mergansers are joined by thousands of gulls, most notably Bonaparte’s gulls. They’re there for the fish, too. 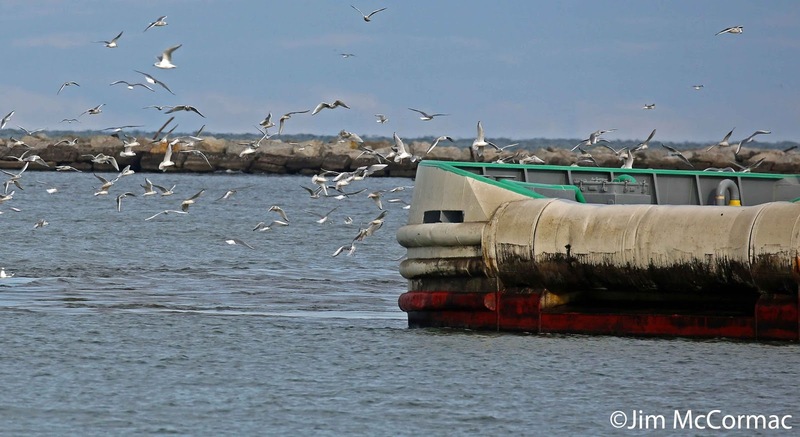 Lake Erie’s abundant fishery accounts for most of late fall and early winter’s avian bounty. Emerald shiners and gizzard shad probably form the bulk of the food base. My fellow observers and I noted hundreds of common loons near the river mouth. They were accompanied by hundreds of horned grebes, another diving fish eater. Birders love to find rare birds, and Huron has an amazing track record. At least three first state records have been found, and lesser rarities are almost to be expected on a good day. My trip was successful on the rarity front. Best was a Pacific loon found by Robert Hershberger, an Amish optics vendor and ace birder. 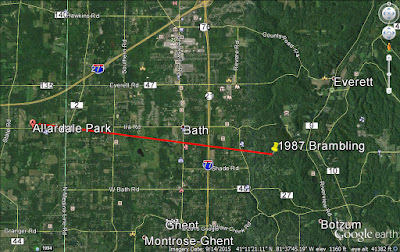 The first recorded sighting of the bird in Ohio was in this same spot in 1985, and only a handful have been reported since. We saw three jaegers, which are Arctic-nesting gull-like birds that pirate fish from other birds. Both white-winged and black scoters landed nearby, offering good looks. Sometimes dozens or even hundreds of these sea ducks can be seen here. At day’s end, I found an eared grebe in the river. Only a few turn up in Ohio each year. In terms of sheer spectacle, the red-breasted mergansers stole the show. At one point, a feed swarm numbering over 10,000 birds stretched for perhaps a quarter-mile just offshore. Many other flocks, large and small, continually passed by in the distance. Lake Erie is an incredibly rich biological hot spot, and the birds bear this out. I hope we can do a better job of caring for it. Naturalist Jim McCormac writes a column for The Dispatch on the first, third and fifth Sundays of the month. He also writes about nature at www.jimmccormac.blog spot.com. This is the mouth of one of the Great Lakes' most fabled rivers, and one its most varied when it comes to habitat. I made this image early in the morning last Sunday, standing at the end of the pier by the old Coast Guard Station by Wendy Park. 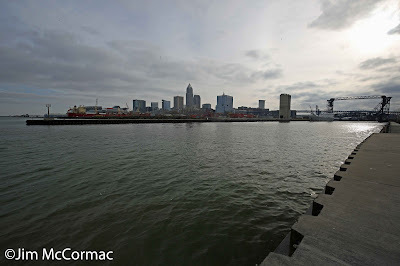 The Cuyahoga River dumps into Lake Erie here, with the city of Cleveland as the background. Lake-going freighters enter the river at this point, and wind their way up the narrow crooked river to industrial operations in Cleveland. Rivers do not come more industrialized than the lower Cuyahoga, but its upper reaches are as wild and biodiversity-rich as any river in Ohio. 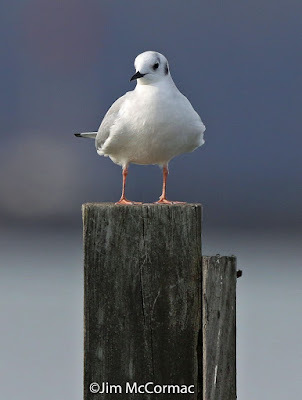 A post-sitting Bonaparte's Gull watches the world go by. It is a rare bit of isolationist repose for the animal. It spends much time in noisy packs of its brethren, fishing the waters of Lake Erie. 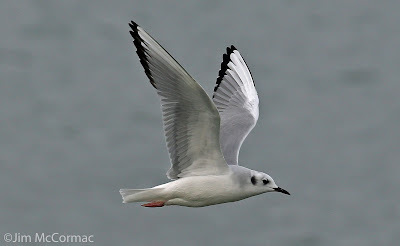 I've written much about Bonaparte's Gulls and will write much more, no doubt. These small delicate gulls are among my favorite birds. They are buoyant on the wing, and talented aeronauts. "Bonies" eschew the aggressive kleptoparasitic ways of many larger gulls, and will rarely be found foraging for garbage. 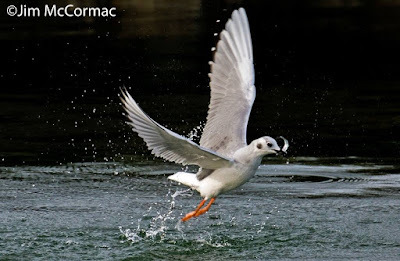 Fishing is the Bonaparte's Gull's stock in trade, and they are quite good at it. The weather was far too placid for great birding on Lake Erie this day, and after an hour or so at the pier's tip I was about to pack it in and head elsewhere. 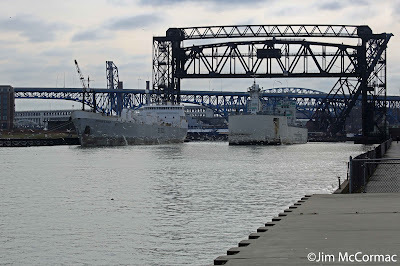 Until I noticed this freighter far out on the lake, but headed towards the Cuyahoga River. Freighters often mean birds, so I decided to remain and await the ship's arrival. It turned out to be a freighter from the Lafarge corporation, a large mining concern. The ship is probably loaded with crushed limestone. Lafarge owns the massive limestone quarries on the Marblehead Peninsula, all around the Lakeside Daisy State Nature Preserve, among many other holdings. If you click the photo to enlarge it, you'll notice a swarm of gulls trailing the ship. The wake of the freighter seethes with gulls, mostly Bonaparte's Gulls. A lot of these birds came in with the ship, and they were joined by many others who were loafing or fishing in the harbor. Freighters stir up fish with their massive props, forcing small species near the surface. 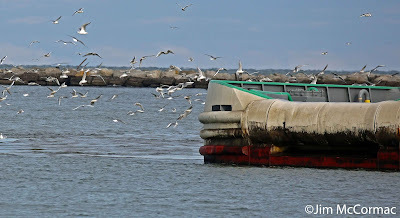 The gulls are there to take advantage of easy fishing. This clumped bunch of Bonies was but a small part of the flock trailing the freighter. So congested is the airspace over the roiled fishy waters that it's amazing the birds don't knock each other from the sky. My hope was that a rarity might be among their ranks. A Little Gull perhaps, or maybe a Black-legged Kittiwake. The big flocks of Bonaparte's Gulls are attractive to such hangers on, and all one has to do is pick through myriad swirling birds to try and find something different. No such luck on this day, but it didn't matter much. I was content to watch the action among the Bonies, and listen to the loud concerto of squeaking buzzes put out by the pack. A successful Bonaparte's Gull leaps from the water with a tasty shiner. The fish was down its hatch within about the first ten feet of flight. If you're a gull, a surefire way to attract unwanted attention is to fly stupidly about with a tail-wagging fish in your bill. You'll be set upon and mugged by about every other gull in the harbor. The Lafarge freighter continues its way upstream, and under one of the Cuyahoga River's many lift-bridges. A pack of gulls continues to follow, but before long most will probably be back in the harbor, or out on Lake Erie. You may recall, this is the river that famously caught on fire in 1969 - for about the 13th time. The '69 fire helped spark a landslide of pro-environmentalism. The following year President Richard Nixon formed the EPA, and the battle to clean up our waterways began. 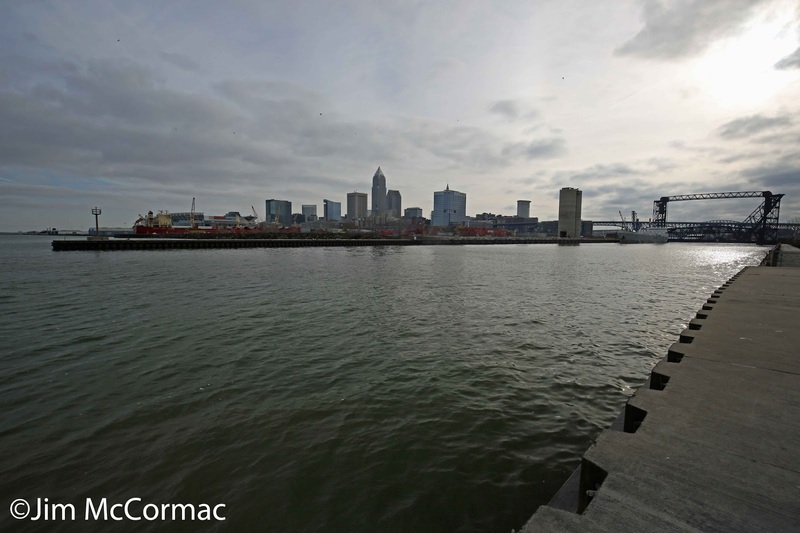 Today, even as industrialized as the lower Cuyahoga River is, its water is far cleaner than in the 1960's and '70's. 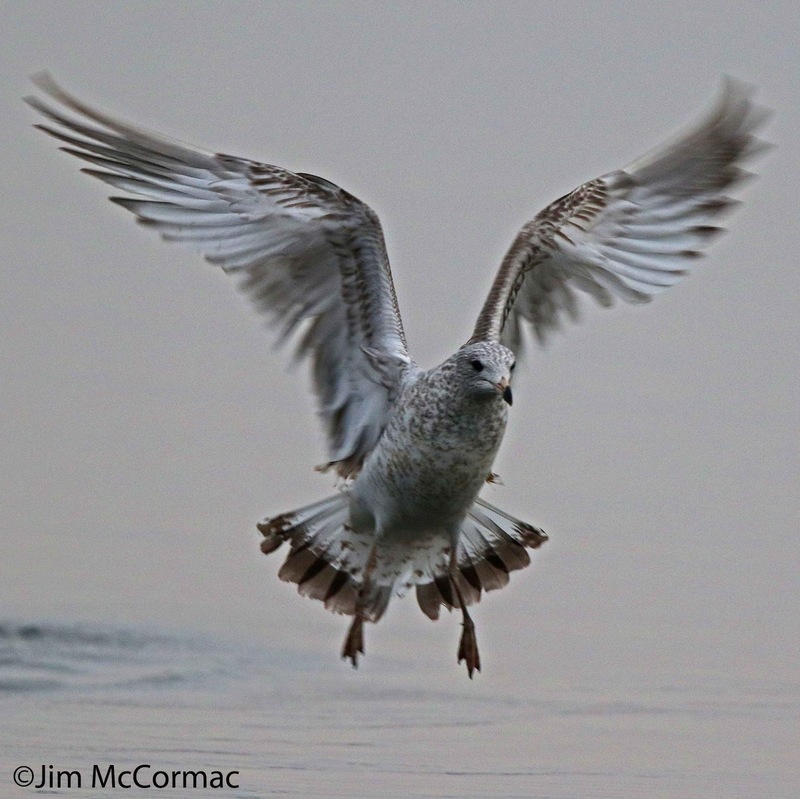 The fish, and Bonaparte's Gulls, are indicators of healthier waters. Now that's a lot of birds! The waters at the interface of Lake Erie and the Huron River are darkened by thousands of Red-breasted Mergansers. Scores of gulls wheel overhead. Everyone is fish-seeking. Lake Erie is the most biologically rich of the five Great Lakes, and scenes like this bear out the aquatic bounty of Ohio's watery northern boundary. A squadron of nine Red-breasted Mergansers rockets by the end of the Huron Municipal Pier. I spent much of the day here on November 22, and was once again blown away by the huge numbers of birds in the area. I've been to Huron in late fall and early winter scores of times over the years and know what to expect on a busy day, but never fail to be impressed. I wrote about some other observations from this trip RIGHT HERE. In that post, I focused on the numerous rare bird sightings that the trip produced. Here, I wish to focus on the hyper-abundant mergansers. A mixture of molting males and female Red-breasted Mergansers bunch together over a favorite fishery. The mouth of the Huron River has long been a major migratory hotspot for this species. Huge, and I mean massive, numbers of mergansers occur in central Lake Erie, especially between the islands just west of here and the Cleveland area to the east. Rare would be the morsel that slides down a Red-breasted Merganser's gullet that is NOT a fish. These birds are piscivorous in the extreme. A sharply serrated bill helps seize and hold the slippery wriggling prey until the bird can manipulate the morsel so it goes down the hatch headfirst. Note this male's wispy punk rock crest. This photo is from last February at a central Ohio reservoir. By then, the males have completely molted into resplendent breeding finery. If I were a small fish, say a shiner or shad, the last place I'd want to be is in the water under these birds. As soon as these mergansers settle on the water, they will begin diving for fish and they're very adept at catching them. The aforementioned fish species are the primary prey items in Lake Erie. Scores of mergansers scuttle across the water whipping up whitecaps. On some unseen cue, hundreds or thousands of birds will suddenly swim-fly hundreds of feet to a new feeding locale. They undoubtedly are chasing the movements of large fish schools that they're feeding upon. This photograph shows but a sliver of a feeding flock that might have numbered 10,000 birds. One of the few detailed studies of Red-breasted Merganser food sources was conducted in western Lake Erie. The results were published in 2008 (Bur, M. T., M. A. Stapanian, G. Bernhardt, and M. W. Turner. 2008. Fall diets of Red-breasted Merganser (Mergus serrator) and Walleye (Sander vitreus) in Sandusky Bay and adjacent waters of western Lake Erie. American Midland Naturalist 159(1):147-161). This study showed that the mergansers primarily feed upon emerald shiners, gizzard shad, and the invasive nonnative round goby - this trio of fishes forms about 96% of their diet. Such knowledge should set fisherman at ease. The huge swarms of fish-eating ducks are NOT competing for prized walleye and yellow perch. The numbers of mergansers on this part of Lake Erie can be stupefying at times. Estimates of 20,000 birds passing by one spot in an hour have been made, as have one-day tallies of up to 250,000 birds. Such numbers would be remarkable indeed, considering the total breeding population of Red-breasted Mergansers in Canada and Alaska is thought to be about 250,000 birds. It must be noted that the margin of error for shorebound observers attempting to estimate merganser numbers is large. There is just no way to know if one is recounting birds that are swirling about in circular patterns or regularly passing by the same locale over and again. However, having seen this phenomenon on numerous occasions from low-flying aircraft while conducting waterbird surveys, I can agree that the above estimates may not be far off the mark. Any way one slices it, there are many tens of thousands of mergansers staging on Lake Erie in late November and early December. It's smack in the middle of this migratory spectacle - likely the WORLD'S most important staging area for Red-breasted Mergansers - that a corporation known as LEEDCO wants to place massive wind turbines. These, I believe, would be the first turbines located in the lake itself. Keep in mind that it isn't just mergansers that heavily use this part of Lake Erie. So do tens of thousands of Bonaparte's Gulls, huge numbers of Common Loons and Horned Grebes, blizzards of other waterfowl species, and scores of other waterbirds. Turbines placed in bird-rich sites can cause great carnage, disrupt migratory patterns, and cause abandonment of habitat. The Black Swamp Bird Observatory has a nice summary on wind power projects in Ohio, including LEEDCO's "Icebreaker Project", RIGHT HERE. 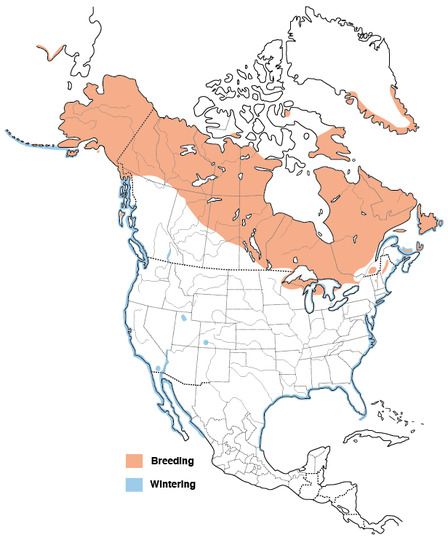 Courtesy of The Birds of North America Online, here is a map depicting the range of the Red-breasted Merganser. The breeding range is generally well to the north of Ohio. Our Lake Erie birds are all migrants, presumably from North America. But this duck also breeds extensively throughout northern latitudes of Russia, Scandinavia, Eurasia and elsewhere. No one has attempted to document the origins of the hordes of birds on Lake Erie. Which would not be easy. ASIDE: I regularly share maps from Birds of North America Online (BNA) monographs, and harvest lots of useful information from these accounts. I've long had a subscription to BNA, and it is a wealth of information about birds. BNA is an inexpensive subscription service, and I would highly recommend it to those that want to advance their knowledge of birds beyond identification. Subscription information can be found RIGHT HERE.